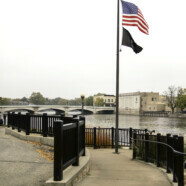 Fort Atkinson updates and adopts Comprehensive Plan | Vandewalle & Associates, Inc.
FORT ATKINSON, WISC. The City of Fort Atkinson Common Council and Plan Commission held a joint meeting and public hearing on Tuesday, March 5 to gather public input on the Draft City of Fort Atkinson Comprehensive Plan–an update to the City’s existing 2008 Comprehensive Plan and a blueprint for the short-range and long-range growth, redevelopment and preservation of the City. Vandewalle & Associates team members Dan Johns and Ben Rohr presented the changes made to the Plan including issues and identified opportunities, data trends, maps, and an implementation matrix. The finalized plan was officially adopted at another joint public hearing on March 19, 2019 by the City of Fort Atkinson.